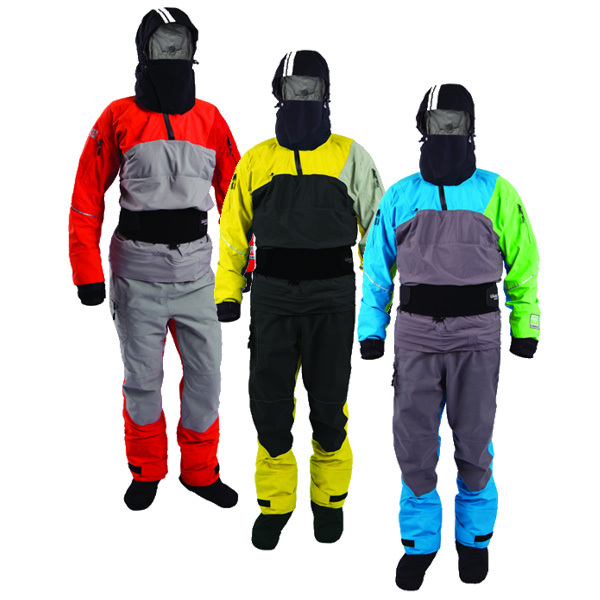 The GORE-TEX® Radius dry suit featuring SwitchZip technology that separates completely at the waist gives touring paddlers the versatility of a dry suit and dry top in one garment. The Radius top can be worn alone as a dry top and has a fully adjustable hood that can be removed or stowed in its fleece lined outer collar. Additionally the top has easy to access, self-draining zippered pockets on each sleeve, reflective accents, and latex neck and wrist gaskets. The pants feature 330 Cordura® GORE-TEX® in the knees and seat for added durability, a pocket on the right thigh, and GORE-TEX® socks. The Radius is backed by Kokatat’s lifetime warranty.